Dr. Dan Pittillo, a member of the Friends of Panthertown Board of Supervisors, taught plant science at Western Carolina University for over three decades, directing the Western Carolina University Herbarium from 1970 to his retirement in 2005. For many years, Dr. Pittillo served as the fall color prognosticator for the Asheville Citizen-Times and many other local and regional publications. His knowledge of local plants and trees is the result of both academic training and many years of observation in the Western Carolina mountains. The following primer talks about the basic science behind what happens to trees when they change colors. Stay tuned to The Tuckasegee Reader for a Q & A with Dan on what it’s like predicting color from year to year. Each autumn our deciduous-leaved trees change from green to the various colors of the rainbow –– red, yellow, orange, purple, and even pink. Because I’m a plant scientist, people often ask me why. Part of the change involves the loss of the green pigment, chlorophyll, that plants need to operate photosynthesis. During the growing season, chlorophyll in a plant’s leaves helps it to capture sunlight and convert it into the energy we all need –– simple sugars. During warm weather, plants can reproduce the chlorophyll as rapidly as it is broken down in the photosynthetic process. As the weather cools in the fall, the air clears and the sun remains bright. Chlorophyll production declines, because the molecules can’t be replaced nearly as fast as they are broken down by the sun. The breakdown of the chlorophyll reveals hidden pigments in the plant’s cells that may have been here all the time. For example, in white ash, there is a build-up of the red pigment, anthocyanin in some trees in the fall, and as the green fades, a deep purple results. A little later in the season, when all the chlorophyll has disappeared in scarlet oaks, the reds become prominent. The bright display of anthocyanin in the fall is what gives the scarlet oak its name. Another pigment present in the leaves but masked by the chlorophyll is a group of yellow, orange, and red pigments known as the carotenoids. The two main types are carotene, the source of the orange color in carrots, and xanthophylls, the pigments giving the sunflower its bright yellow rays. Tannins are brown pigments often seen in oaks. Again, as the chlorophyll in the plants cells declines, these secondary pigments emerge and the leaves turn colors. The fall color change process is complicated and not entirely understood. It’s believed that the secondary pigments may be playing a role protecting the plant’s leaf cells as they “unpack” their nutrients for winter storage. Each year, varying weather conditions play a role in when and how the process is conducted. While cool nights and bright sunny days are necessary for fall colors to develop, temperature and rainfall also influence this process. So too does the health condition of the tree. Infections can cause the leaves to turn brown or even drop. Heavy rains and strong winds can shred the leaves or blow them from the tree. A rapid drop in temperature, especially below 28°F, can cause a leaf’s cells to burst and die, giving us dull green colors. 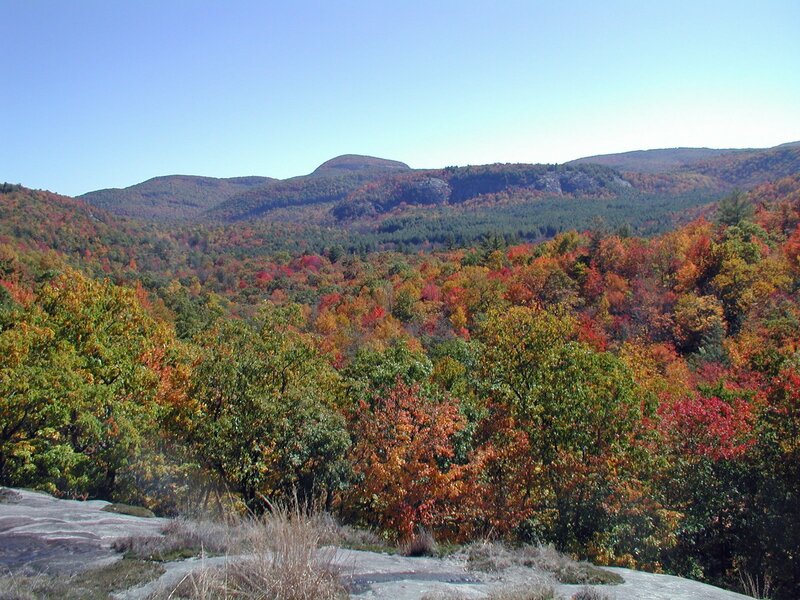 In addition, weather earlier on in the season can also impact the display of fall colors. I hypothesize that a rainy spring encourages tree growth and can focus a tree’s energy into filling out cells, resulting in less pigment build-up in the leaves later in the season. Over the years of forecasting fall color, I’ve come to look for a set of conditions to watch for –– namely a drier year with crisp temperatures in the fall, bright sunny days, and no strong winds or heavy rains. We also recommend you read The Color Man: Q&A with Dr. Dan Pittillo published by Giles Morris on October 4, 2010 in The Tuckasegee Reader. And, 2010 Fall Color Outlook with Pittillo and Mathews published October 7, 2010.